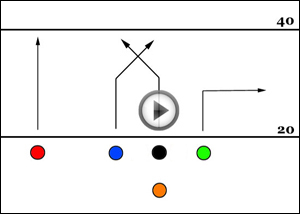 Play Theory: This 5-on-5 flag football play is an all or nothing type play. Using this play in 3rd or 4th and long situations is the ideal time to run it. The goal is to confuse the safety in the middle. The Green receiver runs a short out to occupy the cornerback. The Blue receiver should delay his route to allow the Center (Black) to get ahead. Right after Black makes his cut, Blue should cut underneath. The safety will most likely cover Black leaving Blue wide open for a big gain. Play Variation: Once you run this play a couple times, the defense should wise up and adjust. The adjustment may be for the safety to cover Blue, leaving Black. This can work because there is a cornerback deep on that side covering Red. This is where the variation comes. Instead of sending Red on a Go route, have him hook in. The cornerback will be stuck short. Throw over the top to Black.